Osteoporosis is a loss of bone mass density or thinning of the bones. This loss of bone density happens over a period of time and results with weakening of the bones. Osteoporosis usually affects women over 50 who are menopausal or premenopausal. However, men and younger women can also be affected by osteoporosis. 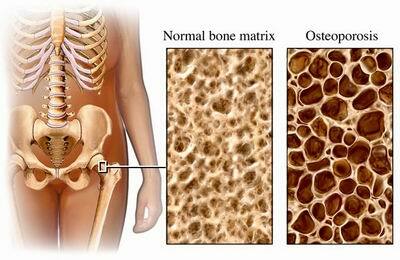 There are many people who actually have osteoporosis and are not even aware of it. Osteoporosis does not necessarily cause any symptoms or pain until a bone fracture occurs. Fractures when they do occur can be very serious and cause a lot of pain. There is no complete cure for osteoporosis. It is very difficult to rebuild bone once it has been lost or deteriorated. Therefore the best treatment is prevention. It is very important to build and maintain strong bones in the earlier years of a person's life with proper nutrition and keeping joints moving properly with chiropractic care. Healthy bone building requires an adequate intake of calcium accompanied with Vitamin D. It is recommended that men and premenopausal women get 1000 mg/day of calcium, and for postmenopausal women to get 1500 mg/day. Vitamin D helps with the absorption of calcium into the body and is important to help prevent osteoporosis. If not enough Vitamin D is obtained, no matter how much calcium you take, it can not be utilized by the body correctly. Vitamin D can come from the diet and by skin through sunlight. People living in the northers hemisphere are recommended to take a Vitamin D supplement, especially during the winter months. People of ages 19 to 50 are recommended to get 200 IU daily, and those over 50 are recommended to get 400 IU of Vitamin D daily. Preventing osteoporosis involves healthy lifestyle habits. Eating a healthy diet is just as important as quitting smoking, limiting alcohol, and consuming caffiene in moderation. Exercise is also extremely important when preventing osteoporosis. Including weight bearing exercises throughout the week actually strengthens bones. Try to include exercises such as lifting weights, walking, swimming, and biking throughout the week. Keeping your spine adjusted and healthy by your chiropractor will help keep your joints moving properly and allow you the proper exercise you need. If you have been diagnosed osteoporosis, the next step is to take action to slow the progression of bone loss and to prevent fractures. You can still live a relatively normal and active life by taking action and preventing the effects that osteoporosis can have. Chiropractic care can help reduce pain associated with osteoporosis. Care can also be given to help treat an osteoporosis-related injury. Chiropractic treatments can improve your range of motion and increase mobility which can help reduce accidents and injuries, as well as prevent back and neck pain. Just be sure to let your chiropractor know about you condition so that your care and treatments can be fitted to your specific needs.